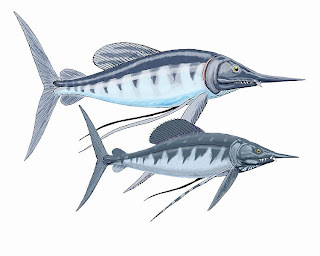 Two species of the swordfish-like Cretaceous pachycormid Protosphyraena. This genus was not even closely related to the modern swordfish (contra Wikipedia), and represents a case of convergence. Reconstruction by Dmitry Bogdanov. The Neopterygii, or "new fins" (not, as it is often translated, "new wings") are one of the most successful clades of fishes today. One particular subgroup of the Neopterygii, the teleosts, includes almost all the living ray-finned fishes. However, just to be difficult, I decided that the most appropriate tack for a post on Neopterygii was to leave the teleosts in all their diversity for another time, and focus on the non-teleost neopterygians. This, as it turns out, was a mistake. The non-teleost neopterygians seem, to a fish, to be almost universally ignored, and most of what there is out there was covered by Toby White almost seven years ago. Nevertheless, I'll see what I can do. The origins of the Neopterygii date back to sometime in the Permian (Hurley et al., 2007). Compared to earlier actinopterygians, the ancestors of Neopterygii lost their clavicle, beginning a trend of lightening and strengthening their skeletons, while at the same time reducing the weight of their scales. Early fish had been heavily armoured arrangements, but like the origins of the modern military, neopterygians were to trade in their clunky plate armour for something a bit more like a bullet-proof jacket*. *Something that has almost nothing to do with the main post, but which struck me when I was thinking about it yesterday evening: When one looks at the living vertebrates only, it is easy to imagine that there was a progressive development of the bony skeleton - at the base of the tree, we have the living cartilaginous fishes and jawless fishes with little or no ossification, followed by the bony fishes and the tetrapods mostly with full skeletons. 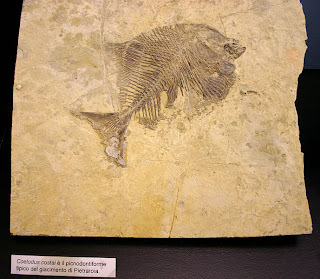 The fossil record, however, indicates that things were a little more complicated - early fishes such as placoderms had extensive skeletons, and the modern unossified fishes are actually the descendants of vertebrates that lost most of their skeletons. However, the original vertebrate bony skeleton did differ from the modern bony skeleton in one major regard - it was on the outside. Early fish had great coverings of bony armour, but little ossified interior skeleton. So over the course of evolution, vertebrates have gone from having their skeletons on the outside and meaty parts in the middle, to have the meaty parts on the outside and the skeletons in the middle. In other words, vertebrates have effectively been turned inside out. Longnose gar, Lepisosteus osseus, one of the few living non-teleost neopterygians. Photo from here. There are few living groups of non-teleost neopterygians - in fact, there's only two, both restricted to fresh waters of North America. One group, the Halecostomi, is represented in the modern fauna by only a single species, the bowfin, Amia calva. As Toby has noted before me, perhaps the single most remarkable feature of the bowfin is that it has absolutely nothing remarkable about it whatsoever. Amiid fishes go all the way back to the Jurassic, and don't look too much different from each other in all that time. The other living group, the American gars of the family Lepisosteidae, are entirely a different matter - gigantic carnivorous fish, with long beaks and sharp teeth. 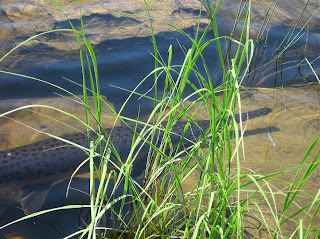 The largest gars can be over two metres long, and according to this site Rafinesque referred to gars up to twelve feet long. They also lay eggs that are toxic to humans. Unfortunately, it looks like American gars don't have green bones, despite common rumour - the green-boned "garfish" is a quite different, marine fish (Belone) nestled well within the teleosts. Bowfin, Amia calva, the other survivor. Photo from here. Relationships between the neopterygian clades are almost completely obscure - while features of the jaw musculature support a relationship between Amia and teleosts to the exclusion of gars, other authors have supported an Amia-Lepisosteidae clade that excludes teleosts. Hurley et al. (2007) found the latter result in a morphological analysis, but the former in a molecular analysis. While a number of fossil groups of non-teleost neopterygians are known, few authors seem to have plugged them into a phylogenetic analysis except for Hurley et al. (2007) and Arratia (2001) (the latter of which I don't have access to). A number of authors have supported a relationship between the gars and the extinct Semionotiformes (Olsen & McCune, 1991), while the Pachycormiformes and Aspidorhynchiformes seem likely to be stem-teleosts. Finally, the Dapediidae and Pycnodontiformes were found by Hurley et al. (2007) to form a third clade in a polytomy with the Amia-Lepisosteidae clade and the teleosts. The pycnodontiform Coelodus costai. Photo by Giovanni Dall'Orto. Some of these were decidedly odd fishes. The Pycnodontiformes were deep-bodied fish, about as tall as they were long. They had strong teeth, and would have fed on shellfish. The Pachycormiformes, mostly pelagic hunters, are best known through the monster Leedsichthys, a gigantic filter feeder growing to lengths over ten metres, which is probably the largest known ray-finned fish. Figure from McCune (2004), showing a reconstruction of Semionotus, and variation in dorsal spine row morphology and overall body shape in Newark Semionotus. Perhaps the coolest of all, though, were the Semionotidae. Semionotus wasn't anything much to look at - not spectacularly large (probably about half a foot) and pretty generalised morphologically. During the Mesozoic it was found in freshwater deposits pretty much around the world, so it would have been dirt common. Where things get interesting is when you get to the Late Triassic and Early Jurassic Newark Supergroup of eastern North America. The Newark Supergroup comprises a series of lake deposits, formed by a process of rifting similar to the modern Great Lakes of Africa. And Semionotus was the Newark deposits' cichlid. Within a single lake deposit, a whole series of Semionotus species can be found, varying from long and narrow to deep-bodied and humpbacked (McCune, 2004). And that is very cool - that the incredible African cichlid radiation is not so incredible after all, but represents patterns and processes that were just as active 100 million years ago. Arratia, G. 2001. The sister group of Teleostei: consensus and disagreements. Journal of Vertebrate Paleontology 21 (4): 767-773. Hurley, I. A., R. Lockridge Mueller, K. A. Dunn, E. J. Schmidt, M. Friedman, R. K. Ho, V. E. Prince, Z. Yang, M. G. Thomas & M. I. Coates. 2007. A new time-scale for ray-finned fish evolution. Proceedings of the Royal Society of London Series B 274: 489-498. McCune, A. R. 2004. Diversity and speciation of semionotid fishes in Mesozoic rift lakes. In Adaptive Speciation (U. Dieckmann, M. Doebeli, J. A. J. Metz & D. Tautz, eds) pp. 362–379. Cambridge University Press. Olsen, P. E., & A. R. McCune. 1991. Morphology of the Semionotus elegans species group from the Early Jurassic part of the Newark Supergroup of eastern North America with comments on the family Semionotidae (Neopterygii). Journal of Vertebrate Paleontology 11 (3): 269-292. Psst... italics tag is left open. Where? It's showing fine on my screen. Just kidding. I also like the nonteleost neopterygii. Very cool group of fishes, even if I'm over fishes for the most part now.